So I didn't try much else until a few months ago, which is sad because before quilting, handwork of just about any kind was totally my thing. It is what it is though and in June, I decided to try hexies, the modern kind, and they did make me happy and keep me entertained for a few weeks. I knew though that they weren't a long-term solution for me. So now. Let's try embroidery! One of the very first types of handwork I ever did, I used to love it as a girl, and my mom taught me oodles of fancy stitches. That all came back as I've seen Dropcloth Samplers show up on Instagram lately. So I ordered the "Original Sampler," which measures 10"x12". The stitches are labeled, which is kind of fun, and I was familiar with most of them though not all. It seemed like a good place to start. Again. 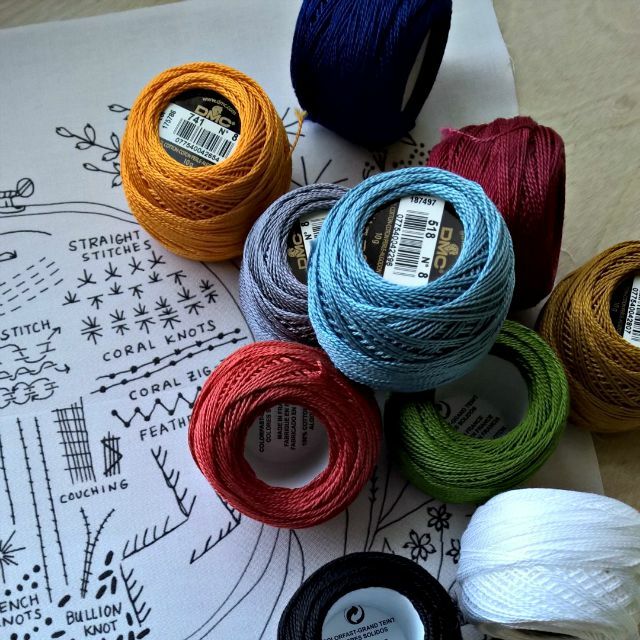 Considering I'd given all my perle cotton to daughter dear a while back, I randomly chose some colors and ordered from Herrschners. I found an old metal hoop from my early days, and got started over the weekend. Who knows how far I'll get, but so far it feels good! This looks really fun and a great review of all the different stitches. I've ordered from Sublime Stitching in the past. Their patterns are really different and their floss colors quite saturated. Pinterest is also full of embroidery patterns, prepare to waste several hours of your life browsing. Have fun with your new project! yay for handwork! And looks like you have a cute bag to carry yours in :::grin::: I do love Rosalie Quinlan's beautiful embroidery pieces and Anni Downs, both Australians. I like crossstitch, but haven't tried embroidery yet. I like so many embroidery patterns I think I will have to get it a try eventually! Bustle and Sew has some charming pieces to embroider. 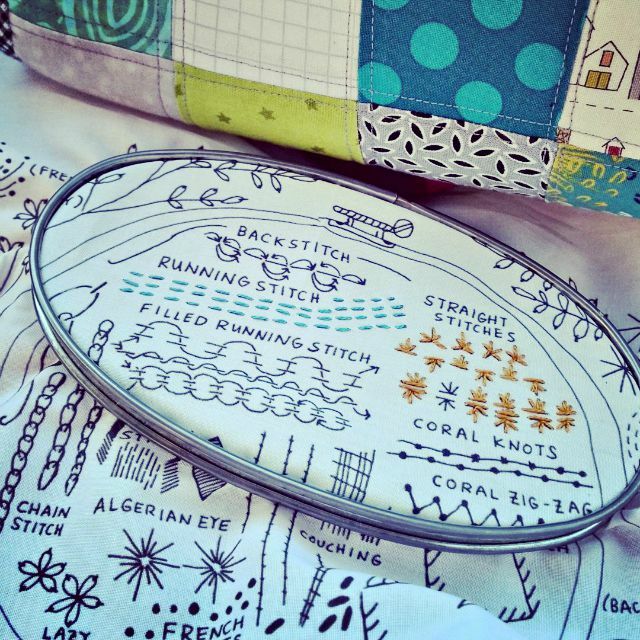 Check out Rebecca Ringquist's Embroidery Workshop book- it is different, modern, and exciting! ops- I see that is what the dropcloth site is!! I am most interested in the comments and suggestions !I love embroidery but also struggle to find modern designs! I love embroidery!! I made up my own sampler and usually draw up my own designs as well :) You just need a line drawing. It's also one of the things I use Pinterest for. To see new modern embroidery designs/color combos and shapes/projects. And to see classic embroidery as well. Oh, I adore embroidery work! I haven't had a project going for a couple years now, but I recently bought a set of four designs related to Iowa. Unfortunately, they didn't come with a color chart, so now it will be up to me to choose. Are you choosing your own colors for this one? About 15 years ago I tried Crazy Quilts and did them for about 5 years. I recently started them up again. They are a great way to do a huge variety of different handwork without the commitment of a detailed project of just one thing like counted cross stitch. Love that sampler idea. I have a question and wonder if you have an answer. I'm "trying" to do big stitch hand quilting on a mini quilt. I bought the number 8 DMC perle cotton and size 8 John James embroidery needles and I'm having a heck of a time threading the needle!! I've tried two different threaders. May I ask, what size needle are you using?